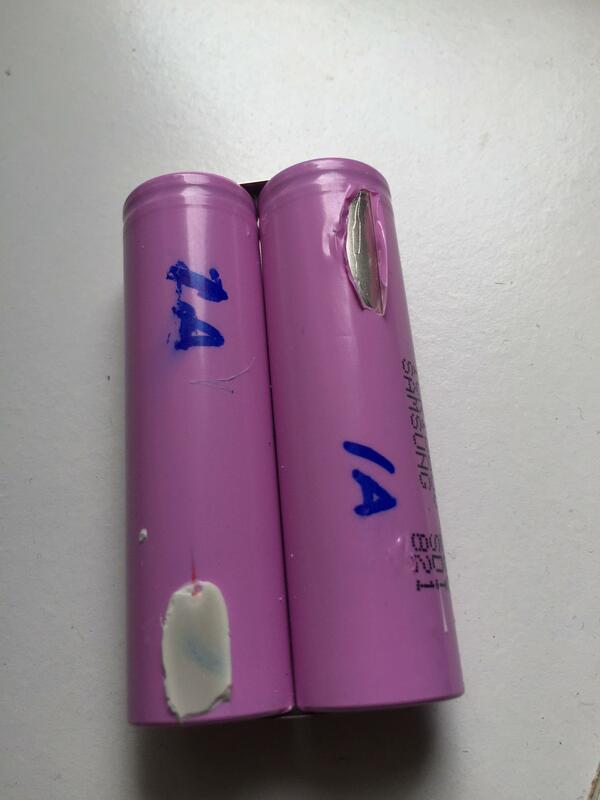 I tried to salvage 18650 batteries from a dead laptop battery, in the process I peeled off and scratched the metal casing a little bit with my utility knife (see attached image below), Other than that batteries work fine (Cells read 4.01v), Is it safe to keep using them? I'm planning to cover the open area with electrical tape. Yes its casing is not punctured. Cover it with tape and keep a closer look on it the first time you charge/discharge. I would still use it. What level of risk you are willing accept is up to you. Be very careful! That scratch is very near to the positive pole, and if those 18650 are the same as all the others that I have used, the bare metal that you have exposed will be the exact same as the negative pole (I.e, the entire metal casing is negative, the small flat top or button on top is positive). So if anything connected to the positive touches that bare metal you will be effectively creating a short and will be in trouble very soon! Shrink wrap made to seal these 'mistakes' would be the safest. Electrical tape always seems to fall off at the wrong time. Not the answer you're looking for? Browse other questions tagged batteries lithium-ion lithium laptop or ask your own question.